Ice Bucket Challenge can be defined as the campaign that brought a new revolution in the field of charity. Apart from fundraising a tremendous amount for the research and assistance for the people fighting with ALS disease, it also inspired other people to start a similar and powerful campaigns at local levels. 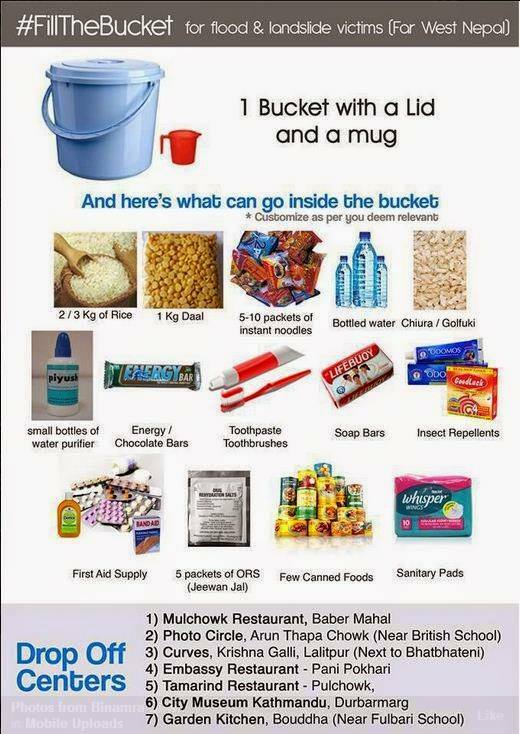 The campaign which is going viral in Nepal, especially Katmandu, these days is the ‘Fill The Bucket’ campaign. People have been emptying the bucket filled with ice water on their heads so far for the ‘ALS Ice Bucket Challenge’ but the ‘Fill The Bucket’ campaign will encourage people to fill up a bucket with the very basic things like rice, noodles, toothpaste and toothbrush, sanitary pads, soaps, basic medicines, etc. which will be provided to the victims of the floods and landslides. There are currently six drop off centers in Kathmandu where the buckets filled with the stuffs are being collected. And the great news is, even if you are not in Nepal, you can still participate in this campaign online via www.cartmandap.com/fillthebucket. Each bucket approximately contains stuffs worth Rs. 1000. See the poster below for all the information along with the addresses of all the drop off centers. Here’s a short video explaining about the campaign.